Bernie Sanders at the Fox News Town Hall at SteelStacks on April 15, 2019. Mark Makela / Getty Images. Everyone agrees: Bernie Sanders’ Fox News appearance was a major success. But most coverage restricts its analysis to Sanders’ 2020 election prospects, overlooking the true significance of the event. It’s not just that he’s willing to make a pitch to Fox’s viewership and thus stands a better chance at winning the presidency — it’s that the Right could lose some of the working-class support it doesn’t deserve, a process that could easily snowball out of their control. For decades, Sanders has been saying that everyone deserves quality health care and education, a living wage, and a truly democratic political system instead of one controlled by plutocrats. He’s also been clear about what’s preventing the attainment of those goals: the corporate pursuit of profit. Democratic voters have started to listen. 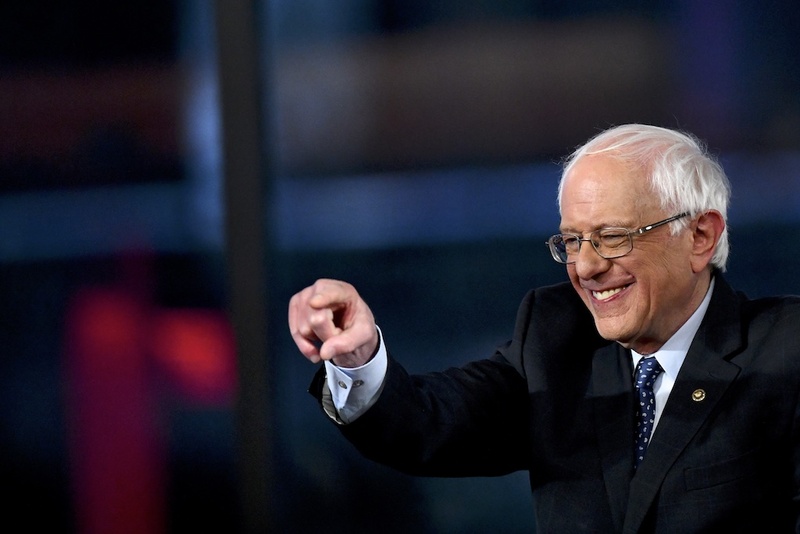 In the Emerson poll — cited by 538 as one of the most reliable — the Vermont senator emerged this week for the first time as the frontrunner in the Democratic Party primary, ahead of every candidate considered tolerable by the party establishment. And it’s high time Republican voters start listening too. Bernie’s political vision is about dramatically improving conditions not just for the Democratic Party’s base but for all people, excluding only the richest. Plenty of people who watch Fox News need to hear this message. Fox’s audience has one of the lowest average incomes of any major news source. Seventy-seven percent of Fox viewers make less than $75,000 a year, compared to 62 percent for the New York Times and 57 percent for NPR. A third of Fox News viewers make less than $30,000 a year. More than half are over the age of 50 and a quarter are over 65, which means a good number are subsisting primarily on Social Security. Since Fox is the most-watched cable news network in the country, we can surmise that millions of its viewers are facing exactly the issues addressed in Sanders’ platform — like pension cuts, medical debt, job insecurity, and unaffordable housing and eldercare. By speaking directly to them about what they stand to gain from his political program, Bernie is not only potentially winning their votes — he’s helping break the spell the Right has cast over the very people it works tirelessly to disempower by starving social services, giving tax breaks to the rich, and privatizing everything in sight. The spell is strong because the Right has provided a convenient explanation for all the hardship experienced by the white and working-class portion of its base. The explanation is that immigrants are driving down wages, unions and government regulations are killing jobs, welfare recipients are taking other people’s hard-earned money, and queer people and people of color — think gender-neutral bathrooms, suburban mosques, and urban crime — are eroding traditional American values, sending the nation into a spiral of decline. There is a powerful alternative explanation: a layer of capitalists is exploiting working-class people and wringing them dry for profit, holding our political system hostage so it can continue getting away with it. That’s why benefits keep dwindling, why the gap between the paycheck and the rent keeps narrowing, and why the future seems so uncertain. It’s not other working-class people who are to blame. It’s the people at the top. This is a strong message, but the Democratic Party refuses to issue it. In 2016, when Donald Trump ran on the slogan, “Make America Great Again” — tapping into dissatisfaction with the status quo by invoking conservative nostalgia shot through with cultural hostility — Hillary Clinton responded with the competing slogan, “America Is Already Great,” effectively dismissing all dissatisfaction. Why are the Democrats so reluctant to offer the competing account outlined above? It’s simple, and Bernie gets it: they don’t want to talk about class because the party is bankrolled and staffed by the rich at the highest levels. Democrats figure that instead of offering a clear competing explanation for economic adversity or a plan to alleviate it, they can assemble a winning coalition simply by gathering up anyone who’s repelled by the vision put forward by the Right — and keep their politically aimless project from capsizing with massive cash infusions. In the United States, no political party exists explicitly to represent the interests of the working class against those of the capitalist class. What we have instead are two parties that split the allegiances of the business elite, with industries like tech, entertainment, and health care favoring Democrats and real estate, finance, and fossil fuels favoring Republicans. The people at the helm of these industries don’t actually care very much about the cultural debates that captivate so much of the rest of the populace. They are driven by a compulsion to maximize profit, and they will make whatever political alliances are strategic to guarantee success. They court business-friendly politicians on both sides. They are even known to switch sides to punish a party for insubordination — not that there’s been much insubordination for the last forty years. Both Democrats and Republicans are obliged to cater to their industry allies and business in general to keep donors happy and the lights on. The fastest way to alienate them would be to start talking about how rich people profit at everyone else’s expense, which raises the prospect of solutions that involve intensive corporate regulation and wealth redistribution. Both parties, therefore, decline to talk about class — the Republican strategy being to offer an alternative explanation for economic woes that relies on and intensifies cultural antagonisms, while the Democrats alternate between refusal to acknowledge economic troubles and insistence that they can be patched up with apolitical, technocratic fixes that don’t offend capitalists. The parties have also worked together, especially in the last half-century, to show socialists and unions the door, which means that class — and specifically the idea that capitalist interests are opposed to working-class interests, that the rich enjoy wealth and power because of the instability and difficulty everyone else endures — has been nearly entirely absent from mainstream political discourse for decades. In this absence of a compelling alternative explanation, cultural resentments flourish. The major parties split not just the allegiances of the capitalists but those of the working class too, and the split breaks down largely along racial, ethnic, and geographical lines. Trump won precisely because he took the Fox formula to the next level, responding to people’s well-founded fears about the erosion of their quality of life by exploiting those cultural resentments and fanning the flames of prejudice. Sanders brings to politics more than just his experience and persona — he is introducing a much-needed alternative explanation for economic distress into our political culture. Unlike the Right’s explanation, which aims to divide, this one unites people who are otherwise different. Bernie Sanders’ story about why it’s so hard to pay the bills — corporate greed, the profit motive — applies to a young black mother who works two jobs and struggles to pay rent and to a seventy-year-old white man who’s working past retirement age with no end in sight. They are both getting screwed by the employers who grant them the lowest wages and benefits possible, the profiteers who sell them necessary services for the highest prices possible, the rich who lobby to pillage the public sphere, and the corporate politicians who carry water for them all. The solution Sanders presents is not for the seventy-year-old white man to blame the black mother for sucking up society’s resources. It’s for them to come together against their common enemy, the clique of economic elites who subject everyone else to unnecessary hassle and downright misery for their personal gain. Bernie’s prescription is a rejection of the scarcity logic that the Right relies on to transform anxiety into animosity and intolerance. Bernie’s Fox News event was just one TV appearance. Even though 2.6 million people tuned in and many more watched it online, it’s still nowhere near what’s required to shift the consciousness and political understanding of an entire constituency. But it’s a necessary start. And once the class idea starts to catch on, it’s going to be hard for the Right to reverse. Bernie’s explanation, and the political program that derives from it, promises large-scale wealth redistribution and strengthened social services that will make day-to-day existence and long-term financial planning easier for huge numbers of people. Medicare for All, a massive jobs program to rebuild our nation’s infrastructure, tuition-free college, universal childcare, a $15 minimum wage, expansion of Social Security — people who struggle with money understand what these reforms would mean for their own lives. The Right can’t compete with that. At the end of the day, all their explanation offers is a frothy mixture of suspicion and superiority. And though it may be temporarily satisfying to Fox News viewers, it won’t pay for the nursing home.